The pressure for businesses to get the most out of their IT environments is fuelling interest in IT analytics. Ask yourself…“Are you looking to gain optimum efficiency and output from your IT department? Are you feeling the pressure to prove the value of your IT department back to the business? Do the words ‘IT analytics’ make you feel confused and overwhelmed? More than ever, IT Analytics is a crucial factor in helping businesses optimize performance and increase profits. 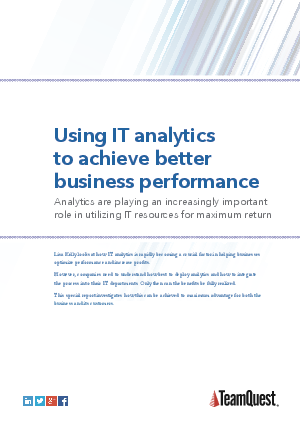 Download this whitepaper to find out how to use IT analytics to achieve better business performance and IT efficiency.